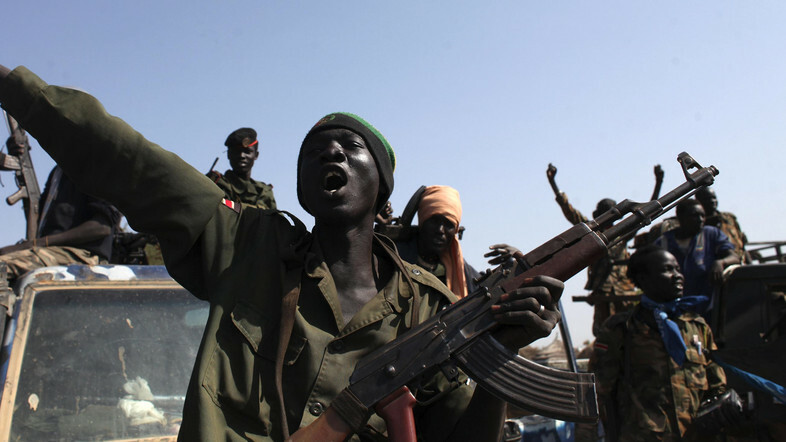 JNN 19 Jan 2014 Bor : South Sudanese government forces on Saturday recaptured the key town of Bor, defeating an army of thousands of rebels, an army spokesman said. UN relief office said Friday that nearly 500,000 people have been uprooted by the conflict erupted a month ago between the government and rebels in South Sudan. “Today the gallant SPLA forces entered Bor, they have defeated more than 15,000 forces of rebel leader Riek Machar and frustrated his plans to attack Juba,” army spokesman Philip Aguer told reporters. Bor is the capital of Jonglei State and situated 200 kilometres (130 miles) north of the capital Juba. The town has changed hands four times since the conflict in the world’s youngest nation began five weeks ago. He also said the Sudan People’s Liberation Army (SPLA) would “observe international rule of law” — a day after a top UN rights envoy reported that the conflict has been marked by mass killings, extrajudicial killings, widespread destruction and looting. “If there are people captured they should be kept in regards to the international law,” the spokesman said. “The Office for the Coordination of Humanitarian Affairs says that nearly half a million people are estimated to have been displaced by the fighting,” UN acting deputy spokesperson Farhan Haq said at a daily news briefing. Meanwhile, he said, aid organizations have reached more than 200,000 people in the country, providing food for over 160,000 people in six states, and nutrition supplements for hundreds of children. More than 86,000 South Sudanese have crossed into neighboring countries since the conflict started, according to the UN High Commissioner for Refugees (UNHCR), which expects the number to exceed 100,000 by the end of this month. Latest government data shows that there are now 46,579 South Sudanese refugees in Uganda. Ethiopia has so far received 20,624, and Kenya at least 8,900. An estimated 10,000 people have also crossed into Sudan’s South and West Kordofan states, which are also plagued by armed violence. According to the spokesperson, UNHCR is working to set up new camps and expand the capacity of the existing ones in Uganda, Ethiopia and Kenya. The agency also urges partners to assist in building up the settlements for an influx of refugees, most of whom are under the age of 18. It currently needs 88 million U.S. dollars to address the humanitarian crisis inside the world’s youngest country as well as in its surrounding region. Meanwhile, the spokesperson said, the United Nations Children’s Fund on Friday expressed its deep concern over “credible” reports that children are participating in the conflict. This entry was posted in Jafria and tagged army spokesman, Bor, Deputy President Riek Machar, Philip Aguer, Riek Machar, South Sudan, South Sudanese, South Sudanese government forces, Sudan. Bookmark the permalink.